Set of my latest sport illustrations, featuring some of the biggest athletes of the world such as: Simone Biles, LeBron James and Usain Bolt. The first illustration is inspired by the gold medallist Simon Biles, who shocked the world with her routine in the last Olympics Games in Rio 2016. 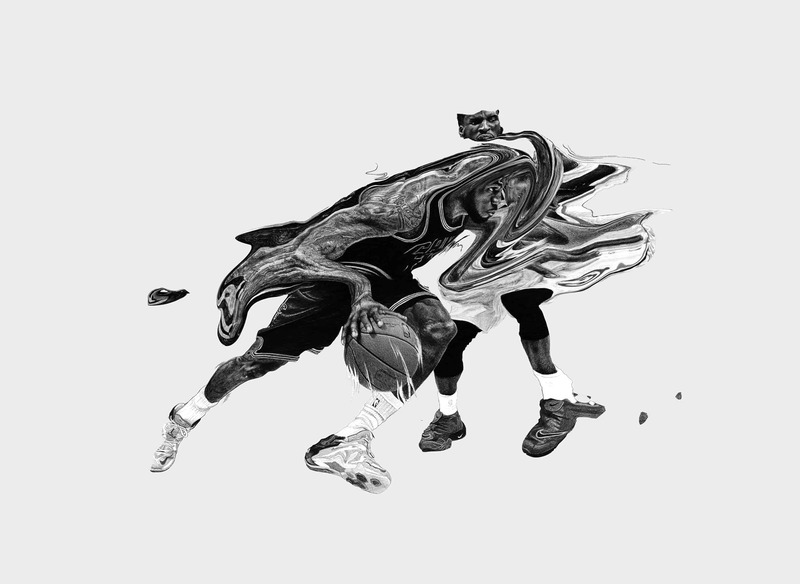 These illustration are a game between the fast movements of the body and how it will look like if we stopped the time, a frozen melted shape in the air as you see in LeBron and Simone illustration, the 3º with Usain bolt is more different featuring the challenge to competing with others strong athletes to hit the time and be the fastest man in the world. The idea was to make an original illustration that was able to communicate the strong, speed, power and the wonderful shapes in every sport. I choose this athletes because they are really close to the people… in some way they represent a lot of people with the same dream, just be the best. Firstly I made the illustration with just pencil and paper. Secondly with a scanner I made a digital file to paint it in photoshop cc using an Ipad pro with pencil. The process is always the same, enhancing lights and shadows in black and white and then add some color to the drawing, for this part is really good to have a tablet like wacom or ipad. I learn a lot about my personal process, enhancing the details and the digital process. I would say the project have been a success because it has allowed me to connect with new clients and do more stuff like this for sport brands. My name is Adolfo Correa. I am a Designer/Art Director from Santiago de Chile, currently living in Spain. Since I started my Graphic Design degree in 2007, I have been working like a freelancer for customers in South America, Europe and USA. Also I spent four years working like a member of an advertising company in Chile called “Doblegiro”. Moreover, I have cooperated with many different organizations for particular projects where I exposed my work. Such us: “Baetulona, 100 años de historia” in Barcelona (Spain) for “Brrothers studios”, “DACS UNITED” exposition in Columbia (EEUU), “Kicking + Screening Soccer Film Festival” in Tribeca (New York), among others.